Something can be learned from every race, and today was an example of just that. Since the Shawnigan 1/2, I hadn't done a whole pile of mileage leading up to this race. With only 10 days inbetween the two events, I figured just to cool it off a bit and to rely on my base training to get me through this run. I felt pretty good on the day, but as was the case before, I arrive to the race only 10 minutes before the race start. There are advantages and disadvantages of carpooling! I quickly ran up to the tent and did the official 'check-in'. 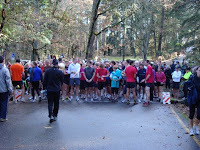 I then said a quick hello to a couple fellow running club members, and began the truncated warm-up. Rumours were swirling that the lake loop was not 5k, as advertised, and people had been saying that it was more like 4.5k in distance. In any event, the distance is fairly irrelevant, as in cross-country racing, it is more about placement rather that time. I had chose to run the full 20k solo this year. Most runners were teamed up in 4's and were doing the usual 4 x 5k relay. I did know of a couple of fast guys who were also doing the solo mission, so it was up to me now to run a consistent race. The race began and I was close to the front of the pack, heading up the paved hill. A few slim tri guys hammered out ahead, and I found my position nicely behind two running partners, Shane Ruljancich and Chris Callendar. The pace was comfortable along the mucky trails. It was easy to get caught up going way too fast when most of the guys are doing only 5k, but I felt good in the early going. At the 1k point, I observed Shane's coach, Paul O'Callahan, warning him not to go too fast. I was there too, so I heard it as well. Shortly thereafter, my shoe lace came undone. I thought to myself ,"I am such an idiot". Shane joked with me and said that some day he would show me how to tie my shoes the right way. Chris told me to stop and tie my shoe. So against much resistance, I stopped and tied my shoe up. A couple of young guys passed me, but I just wanted to get my shoe done up, and done well. The only thing worse that having your shoe lace come undone after 1k in a race, is to have it come undone a second time. The pit stop was quick, and I think it only was about a 20 second stop. I then found my pace again and carried on. I noticed a short while on that Chris and Shane were not that far ahead. I maintained things and eventually got back to the rear of Chris once again. The trails were still mucky, and the hills were undulating. It was near perfect cross-country conditions. As I passed Chris at the 3k mark, he applauded my early effort and commented that I looked strong. He was right, I did feel strong. Shane now was still within eyeshot, but I had no intention of catching him. He is quite the speedster, and in another league to me. The good news was that I survived the hills quite well the first round, and now I opened up the legs on the downhill and caught a runner infront of me. Now rounding the final corner, I could hear the eager crowd cheering for the leaders way out in front. Along the final straight section, which was sandy beach, I could see Shane only about 10 seconds infront. I checked my watch and it was just above 17 minutes. My goal time for the 5k loop was 20 minutes (and this 4 min/km pace was very ambitious over 20k of hill/trail distance). Since this was 4.5k, I figured 18 minutes would be fast. So, 17 minutes was actually too fast, and as I rounded lap #1, my heartrate was crazy high. This would have been an excellent 5k loop for me...only problem: 3 laps to go. My time so far was nothing short of phenomenal. But things could not have been a whole lot worse at this point. Crappy warm-up, started way too fast, shoe lace undone, unexpected hills and now a heart rate and breathing rate that was through the roof. The only way I was going to finish this thing, let alone do well, was to now use my brain. So I consciously decided to slow down and calm myself down. I figured even if I could do a 20 minute loop here on lap #2, that I could still set myself up for a decent time and placement. I really needed to recover here. And that is exactly what I did. I spent the next 3k (the easier half of the course) basically recovering into a comfortable pace. My heart rate was down and I was now relaxed for the very first time. I took the hills in stride and survived them quite well actually. Lap #2 would elapse in 20 minutes, a much slower time than the first loop, but the difference was that I was relaxed and felt that I had at least another 2 loops in me. Lap #3 began the way the last lap did, with a few relay runners hammering by me initially, only to have me catch them again by the 3k point. I was side-by-side with a relay runner who wore a "Westwood Lake Team" shirt, but I eventually caught him just before the hills. The hills once again were difficult, but again, they were not going to stop me. I passed a couple people who were now walking up the hills - these people must be people who I was now lapping. I picked up the pace again for the final stretch and hit the beach section on stride. To my pleasant surprise, my wife, Janelle, and my son, Griffin, were there cheering me on enthusiastically. I rounded the finishing bend and headed out for my final loop. Loop #3 was also close to 20 minutes. With only 1 loop to go, I picked up the pace slightly for the first stretch. The first bit was easier, so I figured I had to make my pace count on the easier section. I knew Shane was miles ahead of me (and he was doing the solo), but I didn't know if any other solo guys were infront. The nature of this particular event (and all the divisions within it) is that it is incredibly difficult to know where everyone is at any given point. I did figure however, that I was in 2nd or 3rd, and that there could have easily been a person or two fairly close behind. I had a pretty good energy for the final loop and once again, the hills would not beat me. I got to the top of them and now I knew that nobody was going to pass me from here on the final 1k. I could hear the cheering of the finish well ahead, and I picked up my pace to be a part of the celebration. Up ahead I saw a young guy going with a fairly good pace, and I made it my goal to beat him. So I dropped the hammer. Not known for a finishing kick, I kicked it as best as I could and took the guy by surprise. He responded with a sprint of his own and now it was all out for the finish line. I didn't know if this guy was running solo or not, but I wasn't gonna take any chances. We equalled stride for stride now and both crossed the finish line at the exact same time: 1:15:55. The finishing time was well below my goal time of 1:20. However, the course was also shorter by about 2k. I would end up finishing in 2nd place in the solo division (5 minutes behind Shane), and I am very satisfied with that placing. In fact, there were no solo runners behind me by minutes. Overall it was a tie for 14th place out of 149 teams. I had many things go wrong for me initially, but as always, I battled on and did not give up, and I am pleased with my final lap time of 19 minutes. I used my running smarts to adjust to things that occurred at the end of the first lap and I benefited from that. However, I have learned not to start too fast (yes, I have said that before so maybe I haven't learned!) and also not to be caught up by the relay nature of things. This is my final event of 2009, and now begins the much anticipated off-season training schedule and Achilles recovery plan. Details to follow in the weeks ahead.